In terms of providing the highest screening attenuation values and ease of installation, PFLITSCH EMC cable glands have been leading the way for years in the screening of individual housings. To ensure cables are routed in machinery and plant in compliance with EMC requirements, PFLITSCH now manufactures customer-specific EMC solutions for use in machine and plant engineering, test laboratories and centres, telecommunications and medical technology. A special aspect of this EMC trunking is the fastening holes at a maximum 50 mm spacing through which the trunking parts and accessory fittings are connected together. The advantage: the cover can be attached to the trunking body tightly without leaving gaps. In tests, this design produced an improved screening attenuation value of -10 dB compared to the standard trunking at -18 dB (measured at 50 Hz). 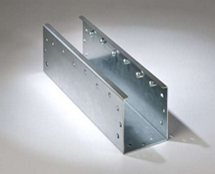 The EMC trunking is made from 2.0 mm thick steel (Mat. No. 1.0226) and has a hot-dip galvanised surface. PFLITSCH supplies the trunking in customer-specific lengths up to 2000 mm and in cross sections from 50 mm x 50 mm to 600 mm x 150 mm. As with all its trunking systems, PFLITSCH also offers a design and manufacturing service for ready-to-install component assemblies and provides the necessary test documentation through its in-house testing laboratory.